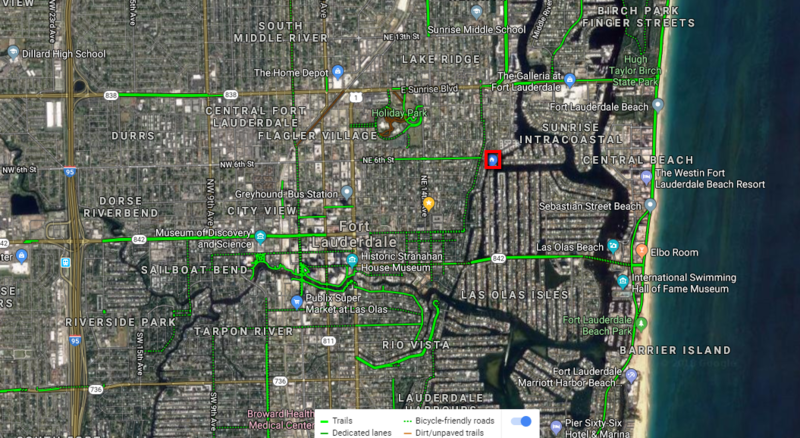 Fort Lauderdale is justifiably proud of the parks and scenic trails and routes it offers for the cyclist. And more and more people are choosing to get around using pedal power rather than less ecological modes of transport. We’ve found that guests who are visiting in their own vehicles often bring their own bikes on racks fitted to the vehicles, especially for the purpose. 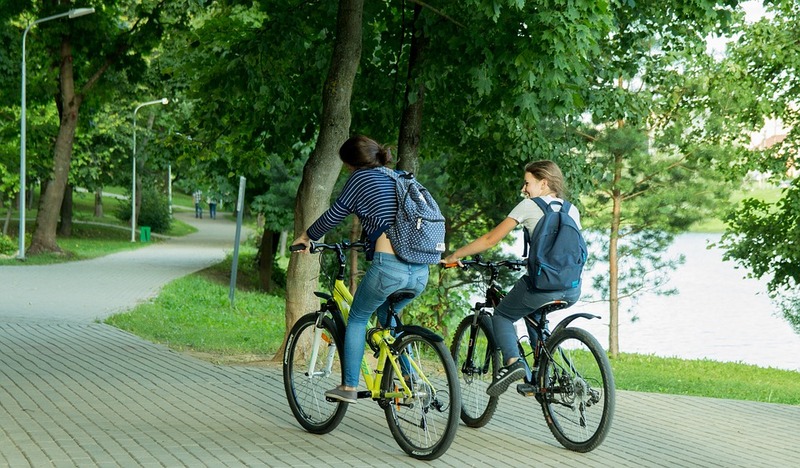 Guests who are flying into town find it’s easy to rent a bike – by the hour or by the day and some love using our local bike sharing service. Use the fabulous Google Maps website to find out where the local bike trails and routes are. When you go to the site and have found your location press the hamburger navigation (the three little stacked horizontal lines) and choose which display you want to see – satellite or terrain. I like the terrain view better for seeing specialist views – terrain is best for roads and driving. In the section below that, you’ll see a bike icon alongside the word ‘bicycling’ and this is the link to click. The map will then show you dedicated cycle trails, bike-friendly roads and those with special bike lanes. See the example below. (Click on the image to enlarge it). If you prefer to rent a bike rather than being your own, we recommend Riverwalk Activities. This is located close to Las Olas Boulevard and downtown. 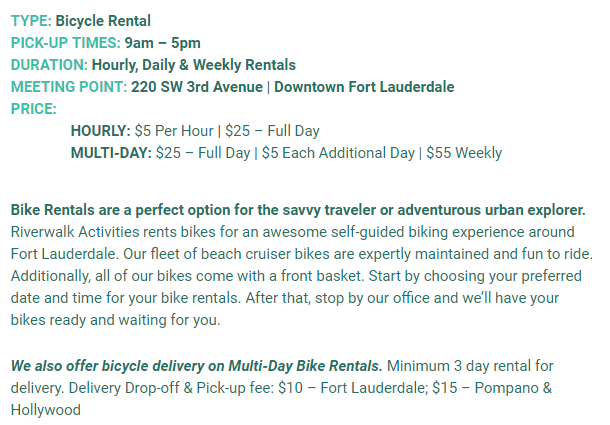 You can rent bikes by the hour or by the day. There’s even a weekly discount too. If you’re renting for more than a day, they will even deliver for a small fee. See the image below for details. (Click it to enlarge). Did you notice the red square on the map above? That’s a great place to stay when you’re visiting Fort Lauderdale. We have two apartments for you to choose from. One if ideal if you’re bringing your own bikes or renting them for more than a day because there’s plenty of room inside to keep your bikes safe; the other has no secure space to keep your bikes (although they can be kept under cover and away from the street) so is perfect for cyclists who are renting their bikes by the hour. This is the first one – a ground floor apartment where you can easily take your bikes inside to keep them safe and secure. If you plan to bring bikes into the apartment, please let us know and we can supply materials for you to cover the floor tiles to keep them clean and undamaged. Our other apartment is slightly smaller, has original Mid-Century-Modern features and a brilliant view – direct waterfront. As it’s upstairs then taking cycles upstairs isn’t practical but your bikes can be kept under cover downstairs. Both apartments are fabulously located within the same tiny complex. The other apartments are owner-occupied.